NISHINOMIYA, Japan (Kyodo) -- Tournament debutant Maebashi Ikuei of Gunma Prefecture defeated Miyazaki's Nobeoka Gakuen 4-3 in the final to win the prestigious national high school championship Thursday. Second-year Maebashi right-hander Kona Takahashi, who had yet to allow a run in the tournament and had gone the distance in four of his five games, allowed two earned runs on six hits. He walked three and hit two, while striking out five. Takahashi permitted his opponents just one scoring opportunity, when Nobeoka Gakuen cashed in three, fourth-inning runs with the help of a throwing error and two walks. Maebashi, which had repeatedly threatened, evened it in a three-run fifth that began with Hayato Tamura's leadoff homer. Kaito Arai put the team in front for good with a seventh-inning RBI single. 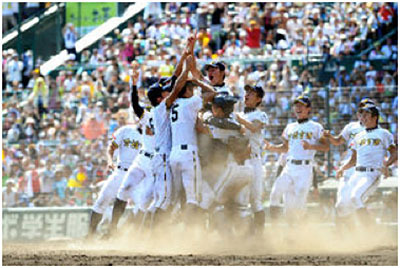 Maebashi's victory was Gunma's first since Kiryu Daiichi won the prefecture's first title in 1999. Nobeoka, appearing for the seventh time, was attempting to become the first champion from Miyazaki.